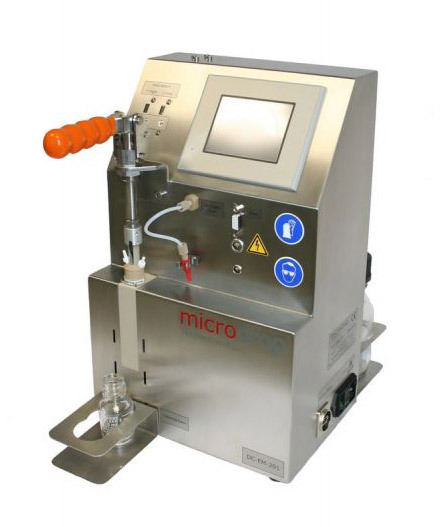 The Stand-alone Cleaning Device allows automatic cleaning of Microdrop dispenser heads (MD-K-series) outside the production environment. The new cleaning device is used for cleaning contaminated dispenser heads and for priming the dispenser heads, i.e. to restore pristine condition. The contaminated dispenser head is clamped into the cleaning unit and connected electrically. The system is set up to handle all usual configurations of the dispenser head. A microprocessor controlled cleaning program includes several rinsing and drying cycles and can be adjusted according to the actual situation (liquid, requirements etc.). The number of cleaning cycles, duration of rinsing and drying procedures and the sequence of processes can be selected. If needed, cleaning can be supported by activating the piezo of the dosing head. The cleaning device automatically executes the complete cleaning program from rinsing cycle to the drying process. Finally, the cleaned dispensing head can be re-assembled into the production line.